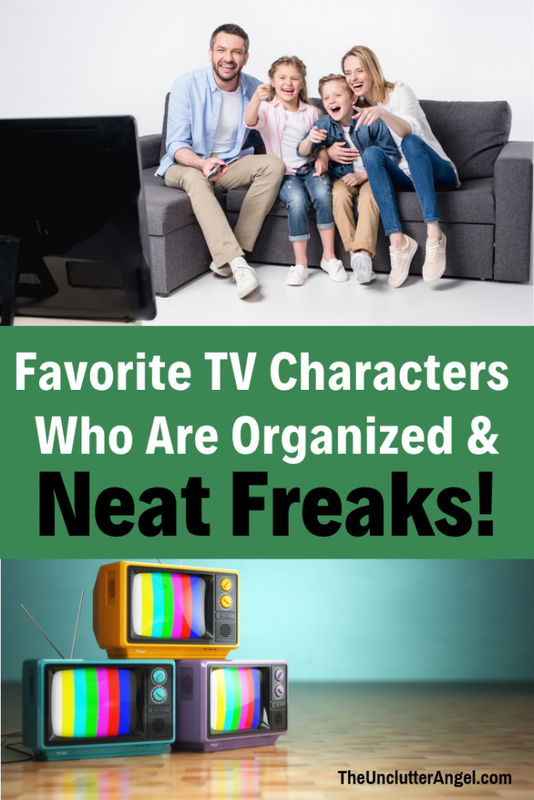 Our Favorite Neat Freaks on TV! There are some fun fictional TV characters who go to the extreme when it comes to being clean! We like to laugh at others and what seems like crazy behavior! 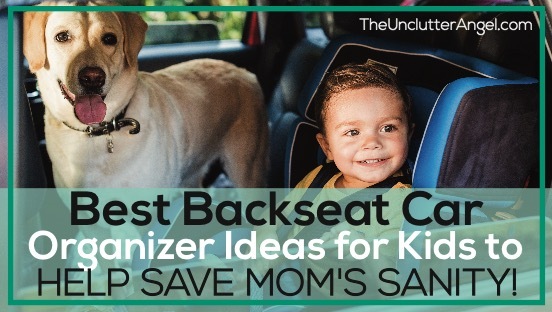 But are they crazy or just super organized!?! Dr. Frazier Crane is a therapist who moved to Seattle from Boston to make a change in his life. He made an even bigger change when he became a radio talk show host, helping counsel people that call in! The biggest change of all? Sharing his apartment with his dad, his dad’s caregiver, and his dad’s dog Eddie!. Frazier learned that he needed to keep his space minimal, because his life had become so complicated. He finds peace when everything in their place! Less is more. The less I have in my space, the easier it is to keep my apartment cleaned up. I like to keep getting rid of things, but it’s not easy when others live with me. I have a busy life, and it seems that unexpected guests can arrive at any given moment. I don’t want to worry about people showing up to a mess . . . what would they think! Even though I have my dad, his caregiver, and Eddie the dog all living under my roof, it looks clean most days. 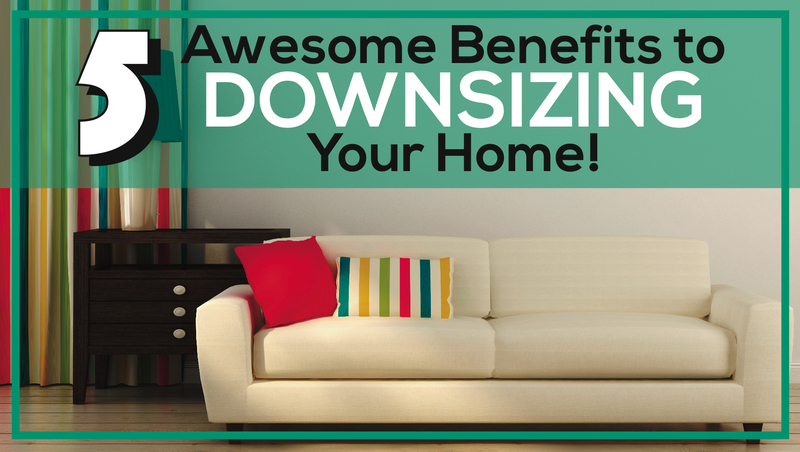 Now, if I could only figure out how to get rid of my dad’s run-down recliner! We all know him as the colorful character on “The Office”. He is an accountant who “actually” thinks he is smarter than everyone around him. Having control, and a sanitary desk, are top priorities! What he loves even more than a clean desk, are charts and papers that are neat and organized! Just because the people around you may be clueless about how to keep papers organized, doesn’t mean that you have to be. I’m a smart guy, and I am giving you a gift by sharing a couple tips to keep your papers completely organized. Don’t let anyone touch your papers. Papers should be filed if they aren’t in your hands. Shred everyday. You can’t shred enough. You don’t want anyone getting a hold of papers that aren’t their business. When you have extra time, which seems like I always do, go through your filed papers. Make sure you aren’t holding onto extra papers you no longer need. Then shred some more! One thing Monica likes more than being in control is being clean and organized! She took on the role as “mother hen” among her group of “friends”. She worked hard to plan activities with her friends that were only good, clean organized fun! Living in busy New York City, with her life always on the go, and she appreciated the time she could spend at the coffee shop, Central Perk. This meant that some days she had less to clean at the apartment because all her friends would meet for coffee out. Win-win! 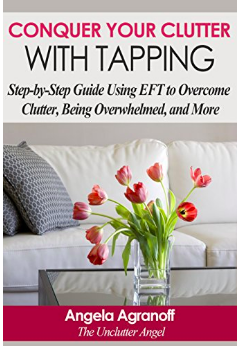 In order to save oneself from going crazy living in a space that is a hangout for many people, (and I have gone crazy a few times, so I am speaking from experience), I have learned to set up a system. They may not be open to it at first, but creating a system to make it easier for roommates, family and guests to want to clean up after themselves is key! I know I have stayed up all night cleaning after a visit from my brother Ross. He is a disaster! HAVE MULTIPLE TRASH CANS – Don’t just have one trash can in the kitchen, have them in every bathroom, office, and maybe even in the living room! Conceal it if you need to, but not too much so people don’t use it. I found this made my life easier not having to run to find a trash can. Having one close to me at a moments notice when someone tries to put a tissue on the coffee table. It’s not happening! PRAISE THEM – Again, this is usually done for children. 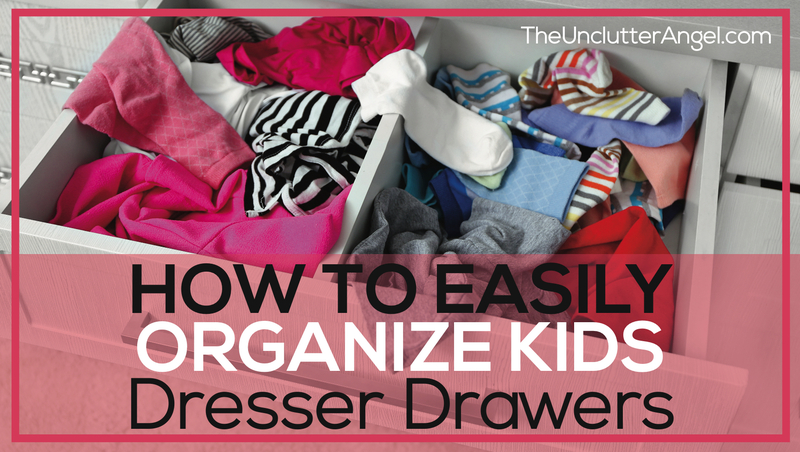 But some adults are child-like when it comes to being clean and organized. Once, I started cheering on someone who threw way a gum wrapper, and I could swear they felt empowered! Adrian Monk is a very successful detective, and just happens to live with OCD. Because of his obsessive compulsive disorder, his life can be complicated, especially when dealing with solving crime and dead bodies! Adrian learned how to use his keen sense of detail to work to his advantage. Adrian is obsessed with having a rigorous schedule and wanting to always have familiarity in situations. This wasn’t easy for assistants who worked for him. Even though he has a delicate emotional state, he is very strong when it came to examining a crime scene! As long as he has his hand wipes and emotional support, Mr. Monk has the ability to solve a crime using his unique examining style and persistence. My number one tip out of the 5,008 I have made in my alphabetical journal, is to KEEP SURFACES CLEAR. By clear I mean nothing on your surfaces, except for maybe an even number of fruit in a bowl, or perfectly aligned books. Gus is the co-owner of a detective agency called “Psych“, as well as a pharmaceutical salesman. Gus sometimes has issues with anxiety and panic attacks, so it is important for him to be organized and know what to expect. Even though his business partner, Shawn Spencer, is the exact opposite, Gus tries his best to keep his life in order. Gus operates at his best when he is organized, and if he is not . . . . it’s not pretty! In order to run an efficient office and business, he has learned that keeping a regular schedule of cleaning and organizing is necessary. Nothing like finding outdated milk in the fridge when one is in the mood for Captain Crunch! You got that right! Food is important, so keep a clean and organized kitchen space. I don’t like anyone messing with my snacks . . . not even my best friend. Clean out fridge on a regular basis. No one likes disgusting surprises! Don’t expect others to know what you want to be done. You can ask for help cleaning the kitchen, but you will make yourself crazy if you think they can read your mind. Even if they “claim” to be Psychic! If you want to keep food for yourself, organize a pantry just for you! Wash dishes right after you are done eating food off of it! This “Parks and Rec” character has become an inspiration for many women who seek to be super neat and organized! 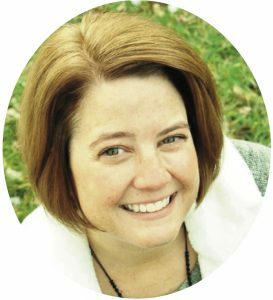 Leslie is an over-achiever who is optimistic and positive in most situations! Even though she isn’t always successful, she tries her best to make the most of every opportunity! Some of the most successful people are hard-working and organized. To meet your goals, I recommend advanced planning and a good attitude! Make a list. Never under estimate the power of a good list. If you are a visual person, create a beautiful poster to help you keep focused on your dreams and the tasks needed to get there. This poster may inspire you to keep moving towards your goals! Keep an organized research binder with a tab for each step you need to take to reach your end goal. Each tab can contain information and research you have done. This binder is critical to keep you focused and excited! Celebrate each step you complete on your to-do list! Unlikely friends, Felix and Oscar, became roommates after they both found themselves divorced. Living together in New York City, their lives were never dull being complete opposites while and trying to make it work. Even with their different ways of seeing the world, they manage to make it through the day! Felix was very grateful that Oscar took him in when his marriage ended, and he repaid him by trying to teach him how to clean up and take car of himself! When Felix reconciled with his wife a few years later, he felt good about caring for Oscar and hopefully teaching him how to better care for himself, even if it only lasted a day! I have so many tips to share about cleaning, it’s hard to just choose one! But since I must, I would say it is so important to keep your bathroom space clean! It is vital to have a space for preparing and grooming each morning. Who wants to do it in front of a dirty mirror and sink! Do a deep clean once a week in bathroom if possible. Keep cleaning supplies in bathroom in case you need to do a quick wipe down. Put away your grooming supplies after each use. This keeps the area clear for your evening ritual. Don’t keep supplies that are old, or that are sitting around and practically empty. Have you ever seen people who keep a number of mostly used items in their bathroom? Wasted space! Use it and throw it out! Just an average guy who works as a blood analyst by day, and serial killer by night. But not just any serial killer. He takes care of those who haven’t been brought to justice. Doing what he does during the graveyard shift takes lots of time planning and executing. One of his best traits is that Dexter is extremely organized! How else could one work around the clock PLUS have a clean house? Even though he has a horrible habit of eliminating criminals, he shows if one is committed, one can stay with a system to remaining clean and neat! One specific item he has mastered is blood clean up! It’s not that I like being a serial killer . . . but then it doesn’t bother me either. I am cool with the whole process, and dealing with the cleaning of blood and body parts is just part of my job. I don’t get blood on me often because I have a system with my work. But if you ever do, whether a bloody nose or a paper cut, try these cleaning tips. Soak fabric in COLD water. (hot water will set the stain) Rub gently using soap and rinse. Then use a few drops of hydrogen peroxide and a few drops of ammonia to remove any remaining blood. If you are unsure of whose blood it is, I recommend using rubber gloves before handling. This is something that I always have plenty of. I especially love the long kitchen rubber gloves. Not real manly, but they are good protection. Wash your garment as soon as possible. Avoid giving it time to settle in fabric and dry. After washing in cold water, don’t dry garment in dryer, let it hang dry. Unless it is completely clean, drying garment in dryer will just cause it to be a permanent stain. Seinfeld, a show about nothing, is a story about a comedian who lives as a minimalist, Jerry, who has a certain way he likes to do things, struggles when he is imposed on by other’s bad habits. What helps him to cope with this? Being organized and in control. Good thing he doesn’t have a roommate! Not much has changed in Jerry’s apartment over the years, it’s so simple. Jerry loves having fun with his friends, nothing like being unproductive . . . . together! But he also loves to have his own space where he can work on writing scripts for television and new jokes for his stand up gigs!! I like to keep every room in my apartment clean and organized. I also like the idea of being organized with my time. I don’t like wasting my time, even though I am surrounded by people who make a career out of it. Sometimes it’s hard to explain this to my friends and family, especially since my friends pop in and out at a moment’s notice. They pop in to eat or stop by to talk about nothing . . . . it’s amazing how long people can discuss “nothing”. If you like your space, I recommend setting boundaries. Friends and family will always be welcome here, but I encourage them to call me in advance. A call, a text, smoke signals, whatever it takes. Just don’t Facetime me, because that is STILL crossing the space boundary. When I make plans and set a time, then I can be prepared. I have also learned that it’s ok to say “no” to people who just want to drop by. I can meet them like at the coffee shop, for soup, or at the movies. I like soup. Soup is good. Romantic comedies are not. Even though I like organizing my time and making plans in advance, I love my friends . . . . even if we talk about absolutely nothing. Even our favorite characters work on keeping their lives clean and organized! Maybe some are freaks about it, but at least they appreciate a clean space! Hopefully you found a few tips that can help with your cleaning and organizing needs. 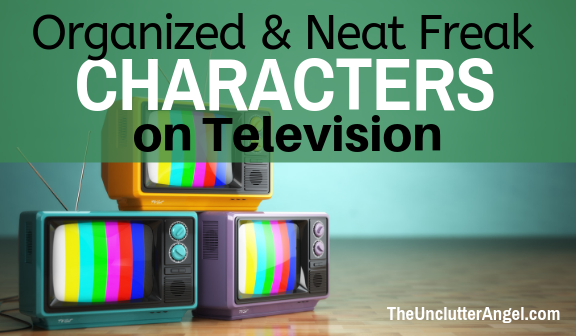 Being inspired from some of our favorite TV characters can make it fun to clean and organize! Who can you most relate to? Who do you want to be more like? 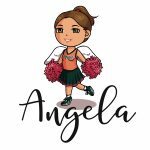 Fun post, Angela. I would add Sheldon (Big Bang) to the list. Thank you Jill! I will get to know Sheldon for sure!